Hotels as models for small businesses? Maybe that's the next big wave of New York Times bestsellers. 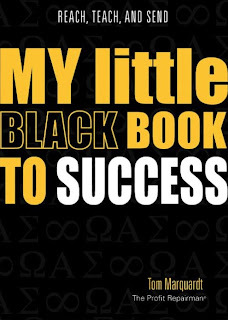 I recently encountered an "ePublication" called My Little Black Book to Success, written by Tom Marquardt, aka The Profit Repairman. Marquardt's secret is, believe it or not, the hotel industry. He says he's spent most of his life in and out of our field, and he suspected that what he had learned could be applied in other areas. Marquard says, "I often wondered if the skill set and techniques that I had acquired [in the hotel industry] could be used in my own personal life and other areas of business to make my mission of increasing the success rate of small and mid-sized businesses a reality. Once I started to implement these hotel principles, it was like a secret formula." True enough, one section of his book is called, "Run your business like a hotel." For more information, visit The Profit Repairman website.